VOX Team puts audio quality above all. Now that Hi-Res has taken over low-quality music, our developers, with over ten years of experience in audio engineering, have designed a robust BASS Audio Engine that makes the most out of Hi-Res music using advanced audio settings. Aside from the Equalizer, they include BS2B, Hog Mode, Crossfade, Apple Audio Units and many others. They all aim to enhance your listening experience with VOX Music Player. 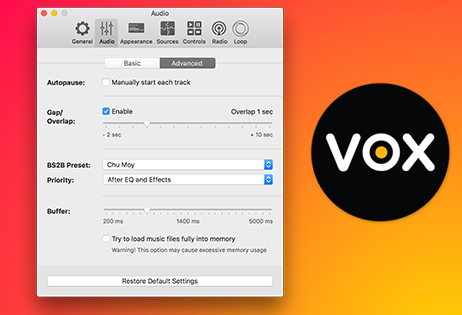 Advanced audio settings are exclusively available for VOX Premium subscribers. If you ever lack loudness, you can increase max volume to 200%. It’s a great option when you have no speakers or headphones. I always use this feature when my portable speaker is dead. N.B: Increasing the limit to 200% may result in the distortion of the sound. This feature sets the sample rate of your output device to the sample rate of your audio file. If SSR is disabled, VOX uses the default device’s SR setting, regardless of the actual track’s SR, and high-quality resampling is applied. Better sound quality due to lack of re-computation otherwise needed. No anti-aliasing takes place, so the audio sounds as close to original as possible. Less CPU time consumption, as result of avoiding re-sampling. This is especially noticeable in Hi-Res audio files with SRs of 96kHz and better. As a result, less battery drain. This feature is for users having multichannel output devices (4, 5.1, 7.1 channel layouts). When enabled, it lets stereo tracks play nicely on multichannel output. By default, when Convert Stereo to Multiple Channels is off, stereo tracks will play into Left and Right channels only. When this feature is enabled, VOX will try to blend stereo information into up to 8 channels depending on the output channel count of the audio device. BS2B is a technology that reduces listening fatigue when listening to music through headphones. Most stereo music is created and produced using loudspeakers. When you listen to music through headphones, you get a sound picture different from what sound producer had. It happens because when you use loudspeakers, you hear both left and right loudspeakers with both left and right ear. When you use headphones - there is a higher level of isolation between the left and right channel. BS2B tries to smoothly blend left and right channels to simulate the loudspeaker setup, so the stereo image in headphones sounds just as if you were listening through loudspeakers in a studio environment. This slider controls the gap between tracks, or how much they are mixed one over another, or overlapped. You can set either 1 or 2-second gap between track, make music play gaplessly, or start the next track sometime before the previous one finishes, with previous track smoothly fading out. Gapless playback is a must for Pink Floyd tracks. HD tracks usually take lots of space. To avoid silence between tracks when they are being buffered, this feature starts loading the next song in advance. This is a vital feature especially if you tend to listen to Hi-Res files.